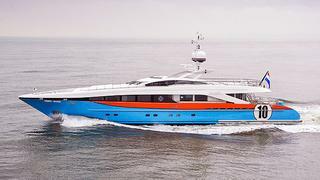 On June 12th 2011 we reported the launch of the 37.3m motor yacht Aurelia at the Heesen yard and now Paula Barber at Ocean Independence in Monaco tells me she's on her way to the Caribbean where she'll be available for charter from mid-December. While the standard layout for Heesen’s 37 series is a five cabin configuration, the owner of Aurelia wanted more comfort for guests and more space for the crew, so designated a guest cabin for the captain. The result is a more realistic six crew for eight guests and everyone benefits from extra living space, plus a welcome and essential increase in laundry facilities. A further aid to comfort, especially when at anchor, is a pair of gyro stabilisers although these are also incredibly efficient under all conditions. Aurelia is available for charter at weekly rates of €105,000 in low season and €120,000 in high season.